All members are strongly encouraged to utilise these connectors for all equipment taken into the field. The more people that use them, the easier things will be in the field when members need to work with foreign equipment and connect things up rapidly. (They also make great 12V connectors around the shack!) WICEN will be stocking limited supplies of these for members to purchase. Members who wish to adopt the new standard but don't want the expense of re-wiring all of their gear, may choose to simply make up enough adaptors, to adapt their own system to the standard. Similarly, members may wish to consider carrying adaptors to and from the old T connectors, to enable them to interoperate with other agencies which still use this connector. The 30A connectors are recommended for most uses, including power connectors on radios, and accessories such as TNCs, computers, small inverters and the like, as well as on power sources such as batteries and power supplies. These are expected to be the most commonly-used in WICEN applications, although some operators may choose to utilise the 15A variant for ease of termination in lower-current applications. The 75A connector is expected to be used where either high current devices are used (such as high-power inverters), or other applications where heavy gauge cable needs to be terminated, such as the heavy-duty 50A or 100A flexible cable sold by various outlets. Such an application could be a long cable run from a 12V battery to a breakout box located in a tent, for example. These connectors are recommended for 12V (nominal) use only. 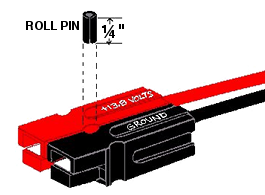 Members requiring high-current connectors for other voltages (such as 24V or 48V systems) are urged to source physically incompatible connectors such as the Anderson SB range, to avoid any chance of connecting wrong-voltage devices together. The same polarity be used across the organisation (as illustrated on this page). This may seem obvious, but we don't want to repeat the mistakes of the past. PowerWerx http://www.powerwerx.com American site (run by a RACES member). Online shopping.